Situated on the north shore of the Clark Fork River, the historic Wilma Theater is an oasis of style, elegance, and contemporary design mixed with 1920’s beauty. Whether you are in town for business or leisure, live the Missoula lifestyle and make one of these independently owned suites your home-away-from-home. This loft has been artfully remodeled and redecorated with bamboo flooring, hand crafted cabinetry, concrete countertops, and includes an iPod docking station and wireless internet. If you enjoy natural light, you'll love it here! Five windows offer a beautiful northwest view, availing you to both sunrise and sunset beauty. Rooftop and street views will stimulate your morning, while the mountains and skyline will calm you in the evening. Whether you're in Missoula for business, summer or winter vacations, photography classes, fly fishing, kayaking, river-rafting, University of Montana Grizzly football games, family reunions or weddings, this is the place for you! When you're tired from your day of Missoula fun, make a reservation at Scotty's Table. This award-winning restaurant is located downstairs and would be the perfect beginning to a dinner-and-a-movie date! Just go back up the elevator and check out a show at the Wilma. Perfect! 7 % tax on all stays under 30 days, NO SMOKING. Pets on approval only. Heart of Downtown Missoula ~ Walk everywhere! Live, work, and play in the heart of downtown Missoula. This 609 square foot condo is in one of Missoula’s most prestigious historic buildings, The Wilma. Located on the 5th floor, this condo retains it's original terrazzo floors and updated with concrete counter tops, stainless appliances, french doors and contemporary paint scheme. Views of downtown Missoula, the "M" on Mount Sentinel, and the surrounding valley. Caras Park is located directly to the South of the building, along with Brennan’s Wave, a kayaking spot in the Clark Fork River. Trails along the river for walking, running and biking. Stroll across the bridge to “The Hip Strip” and enjoy a coffee and pastry at Le Petit Outre or Bernice’s Bakery, or a Missoula micro brew at Kettlehouse Brewery. Lovely location, lovely views. The building is also home to an award winning restaurant, Scotty's Table, The Wilma Theatre and The Big Sky Documentary Film Festival. Like an elixir of days past, The Vantage will transport you to the Golden Era of the Silver Screen, offering a respite from the gorgeous Montana surroundings. Renovated in Summer 2012 by a national award winning local architect (also the owner), this unit has been meticulously created as a luxe refuge, whether you're staying for a few days or a month. Honoring the 1921 birth of the Wilma building, The Vantage is designed in the Hollywood Regency style of the 1920's and 30's. At 741 square feet, The Vantage is a large unit on the southeast corner on the sixth floor. Eight oversized windows provide mountain and river views to the east, south and west. The Vantage offers a full kitchen open to a large living and dining room, a bedroom with queen size bed and en suite full bathroom and a 3/4 guest bathroom (with shower). In the living room, a queen size sleeper sofa provides additional lodging. From the dining area, a fireplace provides ambiance for the connected living and dining areas. Historic 1920's light fixtures compliment the original terrazzo flooring. Crisp white walls are accented by cherry and black cabinetry and silver velvet curtains. Marble floors and walls adorn the bathrooms (in-floor heat at main bath). Typical to the Regency style, African and Asian elements add depth to the experience. The unit has a combo washer/dryer, portable air conditioning unit, WiFi, surround sound, 37" television, Blue-Ray, iPod docking station. The kitchen is fully equipped. 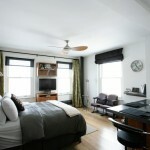 Ironing board, iron, hairdryer and all linens included (down alternative comforters and pillows). From this unit overlooking the Clark Fork River and Higgins Avenue, enjoy parades, Brennan's Wave (kayaking wave), sunrises and sunsets, festivals, restaurants, bars, distilleries and micro-breweries, shopping, farmers markets, film festivals, the Missoula Marathon and walking along the river (for enjoyment or to an event at the University of Montana). On Saturday mornings from May through October, pop down to the Clark Fork River Market to grab local produce and return to the unit to make breakfast while music from the market musicians fills the air. When you need a niblet, take the elevator to Park Level and visit Scotty's Table, a American bistro serving exceptional food. Take in a movie on Street Level at the historic Wilma Theater. The Vantage hints at what life might have been like in the days of Roosevelt, Hemingway, F. Scott Fitzgerald, Louis Armstrong and Mary Pickford, among others. Enjoy a Gimlet as the sun lowers across the valley. Play some jazz. Watch the kingfishers over the river. Be awed by the views--or the vantage--this unit offers. Pause. Relax...Just be in The Vantage. Inquire on rates for longer stays. Dedicated off-street parking. Crib available upon request. The best of Western Montana is at your doorstep with stunning views of the Clark Fork River, Mount Sentinel, Mount Jumbo, the Rattlesnake Wilderness Area, Pattee Canyon Recreation Area, Snowbowl Ski Area and downtown Missoula. All this with the bonus of first-class dining and a historic theater under the same roof! Using the latest in entertainment technology and "green" building materials, this fully remodeled modern loft was designed with your comfort in mind. A full kitchen with dishwasher, all new appliances (including a washer/dryer & Air Conditioning), concrete countertops, rich lighting, heated bathroom flooring, and integrated audio/video/internet components compliment the region's natural beauty. For your entertainment, the flat screen TV with HD programming is just the beginning. There's also an Apple TV, iPod dock, Playstation3, Blu-Ray/DVD, and 5.1 Surround Sound along with free long distance calling and broadband Wi-Fi Internet. If Western Montana weren't so incredible, you'd never want to go outside! You'll drift away to sleep on the queen-size memory foam mattress and there's even a separate full-sized sleeping space created when you fold down the sofa. For those guests with infants, a co-sleeper/crib is also available upon request. Absolutely nothing was overlooked in this top-floor studio that overlooks it all!! This 1200 Sq. Ft. Condo in the Center of Missoula May Well Be the Most Elegant and Luxurious Place to Stay in the Western Montana. The entire condo has been renovated in 1930's European Style, in Missoula's Only Historic Sky Scraper, the "Wilma"
Picture Yourself..Post World War..in Florence Italy ..Overlooking the Arno...Except You Are Right Here in Missoula! Almost Penthouse (7th Floor Out of a Possible 8) the Views Are Dramatic! 10 Windows Provide More Than 180 Degree Views of the Best of Montana, Including being directly over the very popular "Brennan's Wave" (US 2010 Kayaking Team Trials here) and the Clark Fork River. There are clear views of Lolo Peak, Mt. Sentinel, the "M" and Grizzly Stadium. Sunset views rival those of a Pacific island beach front. This is the Perfect Location to Watch a Parade! and the Missoula Downtown. This Condo Has Two Bedrooms and Two Bathrooms, the Bathrooms Are Amazing! Both Have Italian Marble Showers with Rain heads, One Has a Roman Style Copper Soaking Tub. The Living Room and Kitchen Make for a Large Open and Airy Space. The Kitchen Includes Brushed Gold Marble Counter Tops and Italian Dolomite Stone Pavers on the Floor, Calcutta Marble Hutch and Stainless Appliances Make for a Wonderful Kitchen This Are Also Include a Limestone Fireplace, Ample Comfy Seating, Persian Rug on French Parquet Flooring, a Large Flat screen HDTV, WI-FI, as Well as a Separate Wine and Juice Bar Complete the Scene. Other Features Include Stunning yle Chandeliers Throughout, in the Master Bedroom is a 150 Yr Old Chinese Wardrobe with an Additional Flat Screen HDTV. No Expense has been spared in the classic renovation 0f a very special "One of a Kind" condo. Each unit advertised on this website is privately owned and operated.